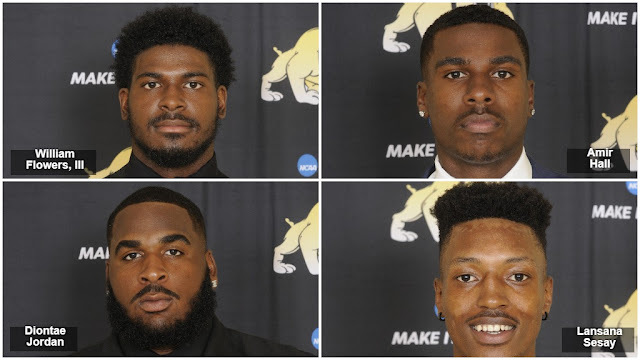 CHARLOTTE, N.C. – The Central Intercollegiate Athletic Association (CIAA) in conjunction with the conference football coaches and Sports Information Directors released its weekly honor roll and four Bowie State student-athletes were voted as Players of the Week for week nine. Of those honored, the Bulldogs are represented by senior Diontae Jordan (Bladensburg, Md.) as Offensive Lineman of the Week for the second time, junior Amir Hall (Bowie, Md.) as Quarterback of the Week for the seventh time this season, junior Lansana Sesay (Bowie, Md.) as Receiver of the Week for the second time and sophomore William Flowers, III (Baltimore, Md.) was named Special Teams Player of the Week. Playing his final regular season game in Bulldogs Stadium, Jordan was rated the top offensive lineman for Bowie State, helping the team account for 562 yards of total offense versus Lincoln (Pa.). Hall and most of his Bulldog starters played slightly over two quarters of action in Saturday's 86-14 Homecoming thumping of Lincoln (PA). Hall completed 14-of-19 passes for 238 yards and tied his own school single-game passing touchdowns record with six. Sesay pretty much simply outran the Lincoln (PA) secondary on Saturday, hauling in four receptions for a game-high 139 yards, scoring touchdowns of 39 and 48 yards. Flowers accounted for 186 all-purpose yards, returned two punts for touchdowns (89 yards and 43 yards) and added two solo tackles in Bowie State's easy win over Lincoln (PA). (November 4th) afternoon at 1 p.m. and are still in the hunt for the CIAA Northern Division crown and a trip to the (November 11th) conference championship game in Salem, Va. The Bulldogs are ranked 20th in the latest American Football Coaches Association (AFCA) Coach’s Poll and 5th in NCAA Super Region 2 Poll. Bowie State holds an 8-1 overall record, 5-1 mark in the CIAA and 3-1 in the Northern Division. If Virginia State University wins this weekend (vs. VUU), they will hold a perfect 7-0 conference record and advance to the championship with the Northern Division title secured. If Virginia Union University wins this weekend (vs. VSU) and Bowie State University loses (vs. ECSU), Virginia Union and Virginia State will both hold conference records of 6-1. Due to the head-to-head tiebreaker scenario, VUU would advance to the CIAA Championship with Saturday’s victory over VSU. If Bowie State wins (vs. ECSU) and Virginia Union wins (vs. VSU), a three way-tie will be held by BSU, VUU, and VSU as all teams will be 6-1 in conference play. Each team will have a single loss to one of the three-way tie teams. The next step in determining the Northern Division Champion will be by point differential. Virginia State is +12 due to their 47-35 victory over Bowie State. Bowie State is +18 due to their 40-22 victory over Virginia Union. This means that Virginia Union will have to beat Virginia State by a minimum of 19 points to secure the Northern Division title. If Virginia Union does not beat Virginia State by the minimum 19 points, Bowie State (+18) will appear in the championship game because they will have the differential advantage over VUU and over VSU’s +12 victory margin. If Virginia Union beats Virginia State by exactly 18 points, VUU and BSU will both hold a victory margin of +18 points. With the same conference percentage, both 6-1, head-to-head will be awarded to Bowie State due to their 40-22 victory over Virginia Union and Bowie State will advance to the CIAA Championship. If Saint Augustine’s University wins this weekend (vs. Shaw) and Fayetteville State University (vs. WSSU) wins, they will both hold a 5-2 conference record. The FSU Broncos will advance to the Championship from the Southern Division due to winning the head-to-head competition versus the Falcons on Saturday, October 21. If Saint Augustine’s wins this weekend (vs. Shaw) and Winston-Salem State University (vs. FSU) wins, they will both hold a 5-2 conference record. The SAU Falcons would advance to the CIAA title game due to winning the head-to-head competition versus the Rams on Saturday, October 14. If Saint Augustine’s falls to the Bears of Shaw University, the winner of the Fayetteville State vs. Winston-Salem State game will advance to the Championship with a 5-2 conference record. SAU and the loser (FSU vs. WSSU) will drop to a 4-3 conference record. Strength and power are two of the most important physical qualities that a football player can have. These Off-Season Football Programs are specifically designed to improve these qualities. There will be an evolution in these programs from a base strength phase through to a peak power phase. Remember to keep a positive attitude and work hard! Juan Caicedo Spring 2018 Swimming Colombia on US Sports Net! College Prospects of America Since 1986 - www.cpoaworld.com The Most Respected Recruiting Service in the World. Scores, Stats, Highlights, and Cool Online Shopping. It's The Scoreboard Mall @ US Sports Radio. The Coolest Sports, The Hottest Talk, Live Online and Mobile. Reach Millions Of New Customer Leads Every Day For Pennies Per Day! Download The 31 Tasty And Guilt-Free Dessert Recipe Book Instantly! The advantages of a quality strength training program for a swimmer has been well documented as more and more of the best swimmers in the world lift weights to improve. It is a key element in the overall training program to help improve times and reach personal bests more consistently! In addition to the increases of muscular endurance, strength and power that weight training will develop, the Swimming Programs also provide injury prevention by involving special exercises for the shoulders and lower back. Throughout the length of the Swimming Program, the manipulation of the sets and repetitions for each exercise will be based on periodization concepts that involve changing the intensity and the volume of the workouts. This variation provides a more consistent "programmed response" to exercise which will help to avoid those depressing plateau's in progress. The starting point of the program is based on an initial fitness level. With feedback, the actual progression of the program will follow the body's unique adaptation process to exercise. Fine tune the program to include all the exercises that feel the best! For this exercise you will need either the reverse hyperextension stand shown in the video, a back extension stand, or a glute hamstring developer. To perform the exercise as shown in the video, begin by placing the appropriate amount of weight on the machine. Lie face down over the top of the stand. Grasp the handles and place your feet through the loop attached to the weight so that the loop is at your ankles. While keeping a slight bend in your knees, contract your lower back and raise your legs up until they are parallel with the floor. To perform this exercise on either a GHD or back extension stand you will position yourself in the same way as shown in the video on either of these pieces of equipment. You will be backwards from the normal position for those pieces of equipment and you will be unable to use any weight other than the resistance provided by the weight of your legs. Then raise our legs up in the same manner as described and shown in the video. This is a great lower back exercise. Click here, and fill out the fitness profile form to get started today! Perfect Game (Baseball) Top 2018 Recruiting Classes on US Sports Network! Flag On The Play Football Party Game Presents (Just Bombs) Featuring: HSP's "The Season" || Episode 1: UCLA Commit QB Dorian Thompson-Robinson ᴴᴰ on US Sports Net! Flag on the Play is a brand new football party game, you put on your wall to play, while, while watching a live or prerecorded football game on TV. For the first time, you get to throw out your own yellow, red and green flags, for a penalty, predict a play and challenge an opposing player, sometimes even before the referees on TV. This is the perfect football party game, because it's super fun, with unlimited players. No friend, family or football fan should be without a Flag on the Play, football game! Even the host with the most...will want to cook early, just to play. Flag on the play is not only fun and exciting, but it easily teaches you the rules and regulations of the game and even children can learn and play it with the best of the best. We want Flag on the Play in every home in the world. It the greatest fun ever, but we need your help to mass produce. Atomic Darts Presents: Suljović v Price (R2) 2017 European Championship of Darts on US Sports Net! We are a family owned and operated company and look forward to serving you in your Darting and gaming needs. If you have questions, comments or concerns about your order or the content found within this website, please feel free to contact us via telephone or email at sales@atomicdarts.com and one of our experienced team members will get back to you right away. Again, thanks for visiting our store and we look forward to serving you with the highest quality of care. Dr. Nuzum - The Truth About Cancer LIVE Highlights 2016 | Plant Medicine & How to Detoxify Your Body on US Sports Net! The Truth About Cancer’s mission is to inform, educate, and eradicate cancer in our modern world. Every single day, tens of thousands of people just like you are finding natural ways to cure cancer and learning to live healthier lives to prevent cancer from ever touching their bodies. You can take control of your health and educate yourself on true cancer prevention and natural cancer treatments. It could save your life or the life of someone you love. A Hayward officer's gesture of goodwill on US Sports Net! Instead of towing her car, a Hayward Police officer bought the family a meal. 5 Free Videos Reveal The Secret To Tactical Muscle! Stone Softball Strength & Conditioning Program on US Sports Net! Girls are doing core strength exercises as part of their softball training program. Our goal is to develop strength in key areas for our softball players to prevent injuries and improve performance. Softball The Softball Programs have everything needed to maximize the physical tools used for playing softball. Rotational power movements, shoulder and lower back injury prevention exercises, forearm strength, it's all here! Playing softball places specific demands on the body and these programs will help meet these demands! In these Softball Programs, the sets, repetitions, exercise prescription, and actual weight of the programs are based off an initial fitness level and a specific strength to bodyweight ratio. With simple feedback, the progression of the program will follow the body’s unique adaptation process to exercise. Click here, fill out the fitness profile form and your coach will contact you with workout recommendations in 24 hours or less. Work hard, play hard, and have fun! Just click on the name of the program you'd like to use and enter its name on the fitness profile form. Don't worry if you forget the program name. Simply enter your sport and position in the "Fitness/Sport Goals" box of the fitness profile form. You will need a clear path for this exercise. This path should be at least 4 feet wide and 10 yards long. Grasp one dumbbell with both hands. Stand up straight, place your feet slightly closer than shoulder width apart, and keep your feet flat on the floor. Maintin good posture and keep you head and neck facing forward throughout the exercise. Hold the dumbbell in front of your body with your elbows bent at a 90 degree angle and your upper arms next to your sides. Step forward approximately 2 to 3 feet, placing your foot flat on the floor. Lower yourself down as far as is comfortable for you or until the thigh of your front leg is parallel to the ground. You back leg should also bend slightly until your knee barely touches the floor. 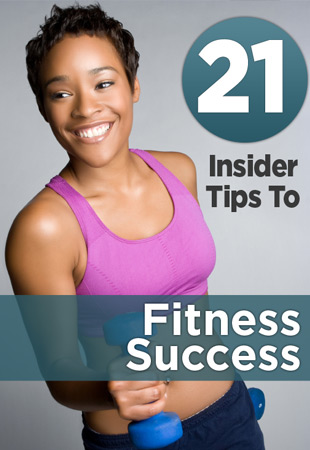 As you are stepping forward, rotate your shoulders, torso and the dumbbell toward the same side as the lead leg. Breath in during this phase of the exercise. Now, stand up onto your front leg lifting your back leg off of the floor. Rotate the dumbbell back toward the center of your body as you come up to a standing position. Breath out during this phase of the exercise. Now, repeat the forward lunge and rotation movements with the opposite leg. Continue walking forward and rotating toward the lead leg until your have completed all of your repetitions. Each leg must complete each repetition so if your workout calls for 8 repetitions you would need to take 16 steps total! Lying on a bench with a slight incline(15-20 degrees). Begin with the weight extended over your chest with your arms perpendiclar to the floor. Bend your elbows slightly. Open your arms and lower the weight down as far as is comfortable to you. Relax your chest allowing the weight of the dumbells to stretch your pecs for the time allowed. Sale on Sale - Take an extra 25% off Women's Sale Items! Just use code SAVEMORE25. 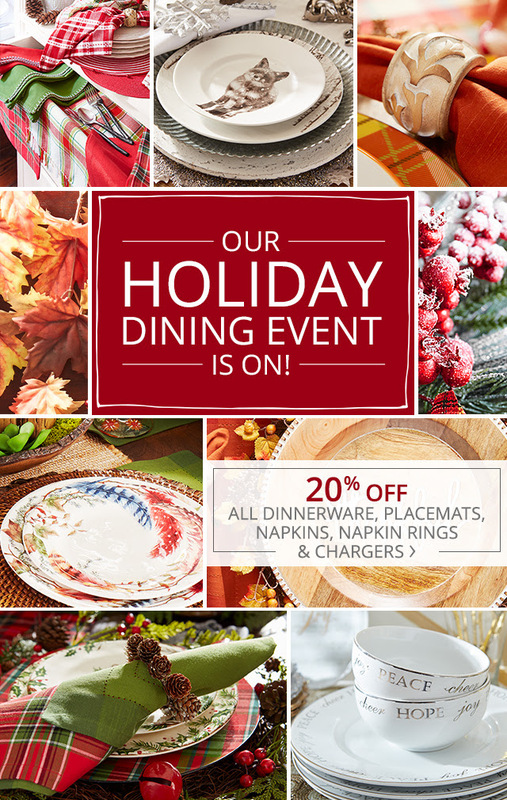 Valid 10/27-11/1. With designers like Prada and Tome sending plaid prints down the runway, the fashion world took notice. This fall, ‘70s plaid is back, but with a major upgrade. Think modern patterns and versatile pieces like scarves and skirts. Here are a few of our favorite pieces to bring plaid into your closet this fall. This preppy-meets-retro mini skirt from CHOiEs is perfect to pair with a white blouse and black boots. Throw on a blazer to complete the look. Every girl needs a go-to blanket scarf and we love this one from ILY Couture to dress up or down. Wrap once for a casual look or twice to bundle up on chillier days. These slip, tapered pants from Macy's make a statement in any wardrobe. If you’re bored with the usual black or gray slacks, these spice things up for fall. 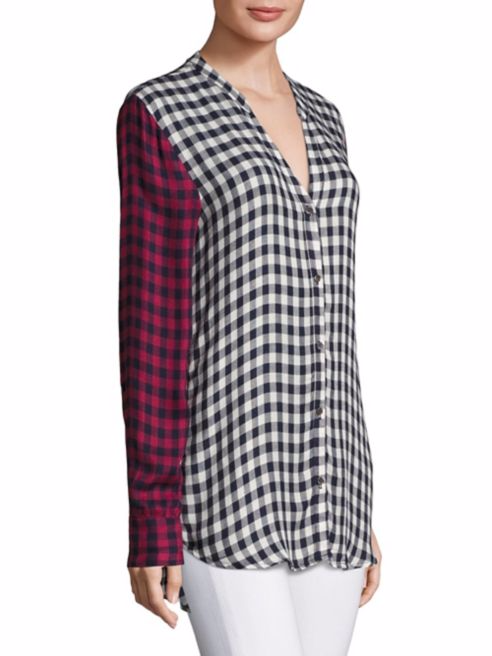 This gingham plaid top from Saks Fifth Avenue features a two-tone design that truly stands out. Pair it with dark wash skinny jeans for a night out or tuck it into slacks for work. Ivory Ella is a brand you can feel good supporting! It was founded on the principle of living a life devoted to saving animals, helping others, and doing everything you can to support your community. Ten percent of the brand’s profits are donated to charitable organizations that benefit both humans and animals alike. They encourage personal style that you can be proud of — Good Clothes for a Good Cause. Here are a few of our favorite pieces that give back. Take action to promote the conservation of giraffes with this World Giraffe Day Tee, sponsoring The Giraffe Conservation Foundation. The back of this tee features a sweet savannah design that’ll make you feel good about the mission you’re supporting. Aid in Ewaso Lions’ effort to conserve lions in Kenya with this tee. The Ewaso Lions is an organization dedicated to conserving lions and other large carnivores by promoting co-existence between people and wildlife. The relaxed, extra long fit is perfect for lounging in or pairing with jeans for a casual weekend look. Over 28,000 children are diagnosed with a life-threatening illness annually in the United States and its territories. Make a difference with this t-shirt and help benefit children battling illness across the country. With over 100 handcrafted and polarized gorgeous designer shades for only $29.95, everyone can be anyone with Prive Revaux. Spotted on celebs like Jennifer Lopez and Jamie Foxx, Prive Revaux shades are meant to be worn all year — not just the summer months. The brand’s newest Icon Collection for both men and women consists of vintage styles with modern flair that make these frames anything but ordinary. Make a purchase from now until the end of 2017 and receive a promotional code for 25% off any future purchase. Here are a few of our favorite pieces from the Icon Collection. These frames have you seeing the world through colored lenses, just like Warhol himself. A classic nose bridge finishes off this easy-to-wear style. A classic aviator style, with a hint of sophistication. From bomber jackets to blazers, this style is your new go-to. Channel Audrey Hepburn vibes in the frames that embody her signature look. Go for the black style to achieve the casual-cool that made Audrey a star. Find Even More Deals While You Enjoy Live Sports! @ The Scoreboard Mall at US Sports Radio! The NBA On US Sports Net! Cops do good deed on US Sports Net! Big Ten Network on US Sports Net! ALERRT Police Training on US Sports Net! Today's Live Sports on US Sports Net! $99 DGC Custom Glove Sale!